Who will beat The Blackout? Having run a traditional open mic for many years, our waiting lists to perform were becoming longer… and longer. With The Blackout format we can get to acts quicker, speeding up the process of being seen and hopefully being developed at Up the Creek. 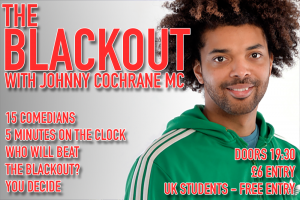 The idea is for performers to have at least five minutes of comedy material…if not the stage is plunged into darkness as you hit The Blackout. Each event features 15-17 acts who are given 2 minutes of free stage time. At the start of each night our MC hands out Blackout cards to three members of the audience. They are the crowds representatives for the evening. After the set 2 minutes, they can choose to hold up their Blackout card if they are not rating your performance. When all three cards are held up you get a BLACKOUT. All lights on the stage shut down, leaving it in total darkness. But if you last the whole five minutes, the music blares triumphantly, lights flash because CONGRATULATIONS, YOU BEAT THE BLACKOUT! Please get in touch with us if you'd like to perform at The Blackout. If you would like to either perform at The Blackout or enquire about tickets, please email us at Thursdays@up-the-creek.com.